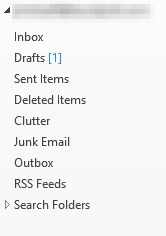 I got really used to having quick access to my unread messages using the Unread Mail favorites folder. Every time I have a new account using Outlook, I always forget to add it back, since it's not done automagically anymore. Once I remember I want it back, I have to look up how to do it! Sad thing is it's pretty easy. At the bottom of the list of folders in your account, there's a Search Folder. Right click Search Folders, and click on New Search Folder. 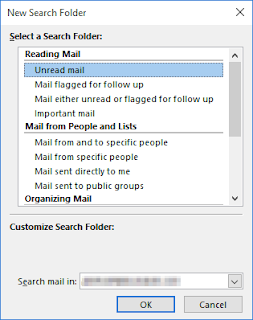 Make sure Unread mail is selected in the Search Folder box and click OK. When your WSUS folder starts getting out of control, or you've removed a lot of stuff and the cleanup isn't giving you back your space, here's how to do a reset. Click on Windows® Start button. For Windows XP® select Run. For Windows Vista® and Windows® 7, use the Search field. Enter the command Actdiag and press the Enter key. Within the Actdiag program, select Server on the menu bar. From the menu, select option Server Security. 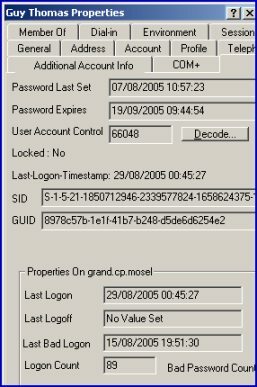 Click on the Reset SQL Password button. Click OK to continue when prompted (do not attempt to enter a password). Message Reset SQL Password will appear, click OK to complete the process. Click on the Windows Start button and select Run. For Windows Vista and Windows 7, enter the command Run into the Search field and press the Enter key. In the RUN window, enter the command Net Stop MSSQL$ACT7 and press the Enter key. Return to the RUN window, enter the command Net Start MSSQL$ACT7 and press the Enter key. Launch Sage ACT! and update the database. The Outlook Secure Temp folder is a super hidden folder, so, unless you know the full path (and it's randomly named folder, you're not finding it. And that's fun when you have a user that's trying to play the 100th copy of a file with the same file name (can you say "voicemail messages"?) and they get an error message. To find the Secure Temp folder, you have to hop into the registry. Where the number is the number of your version of Outlook. 15 is Office 2013. 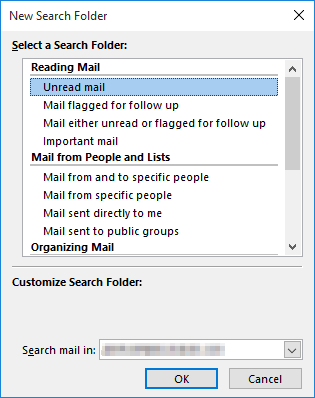 The registy entry will give you the file path of the Secure Temp folder, go to it and delete the contents (after you make sure they don't have any attachments open from Outlook they haven't saved elsewhere). After that, the countdown to the next 100th file starts! The Additional Info tab in Active Directory Users and Computers is like, my favorite thing evar. And just because of the Password Expiration date. All the other info it shows is just a bonus. SID is helpful for when profiles poo the bed. Here's how to get it. This should be done on the computer you are using to to run ADUC, not the server.... unless you're using the server to view ADUC. Download the same installer from above. Extract the files. Move or copy acctinfo.dll to C:\Windows\SysWOW64.